Thomas Colleton Garth Esq. of Haines Hill, was Master of his own hounds from 1852-1902, and to celebrate his 50 years, the hunt was named “The Garth” in his honour. He was the son of Capt. Thomas Garth [RN] and was one of the best, most popular Masters in the country, a Justice of the Peace, and Deputy Lieutenant of Berkshire. 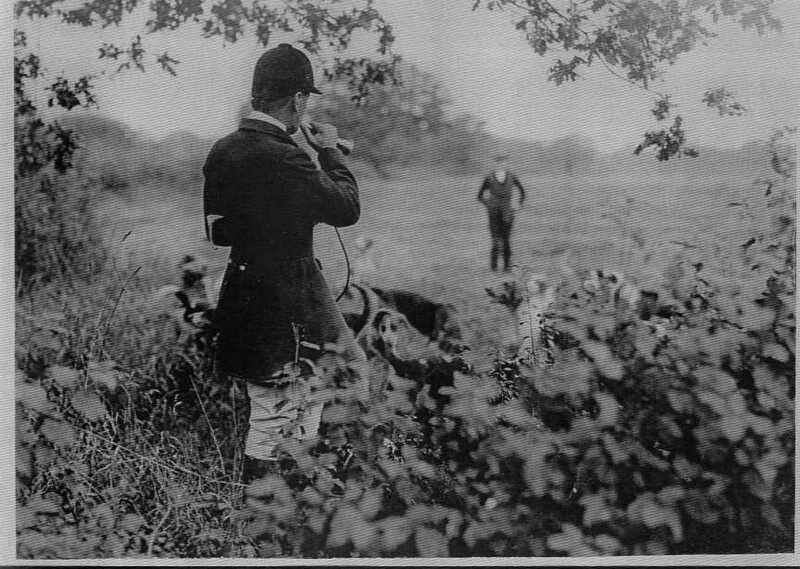 Mr. Garth took over part of the hunting country given up by Sir John Cope of Bramshill, as described in a series of historical articles named 'Hunting in Berkshire' in the 'Reading Mercury' of 1921. 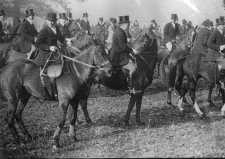 In 1852, the “Opening Meet of Mr. Garth’s Hunt” was held at Haines Hill, with Robert Tocock as huntsman and Henry Tocock [his son] and Thomas Sweetman as the first and second Whippers-In. The Hunt met mostly in Berkshire and Hampshire, and locally at Barkham Square and Newlands. 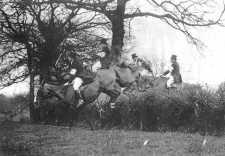 This continued until the 23rd March 1962 when the last meet took place on The Green at Sherfield on Loddon, prior to the amalgamation with the South Berks Hunt on 1st May 1962. Miss Effie Barker of Stanlake Park, Master of the Garth Hunt for its last 26 years, was also Master of the newly amalgamated Garth and South Berks Hunt for a further 4 years. The Garth's attempted amalgamation with The Vine failed in the 1990’s, but it is now part of the Kimblewick Hunt; here is a link to its web-site. 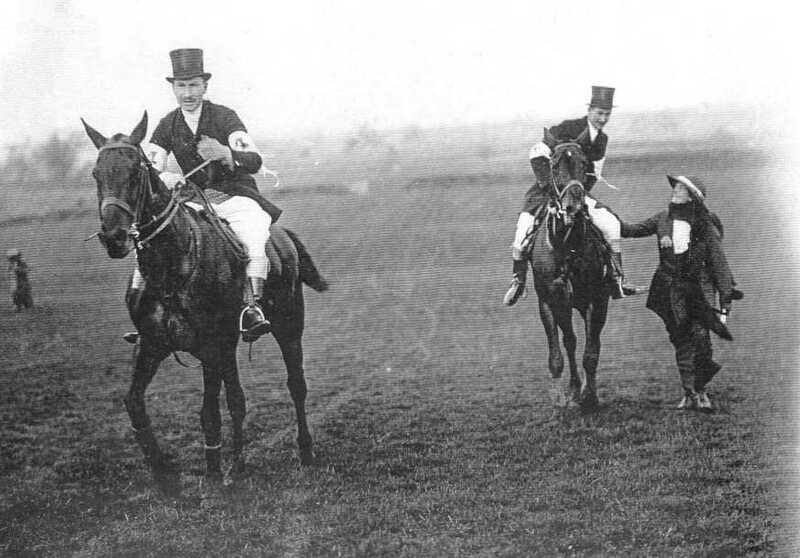 As well as regularly hunting foxes, the Garth organized their own point to point races. The first of these was organized by Edward Sturges J.P. of Barkham Square in 1904. 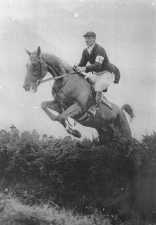 Other venues used included Ashridge and Ashridgewood Farm, Wokingham; the Army Remount Depot, Arborfield; the Newlands Estate, Arborfield; Lordlands Farm, Hawthorne Hill and Cowfold Farm, Rotherwick. 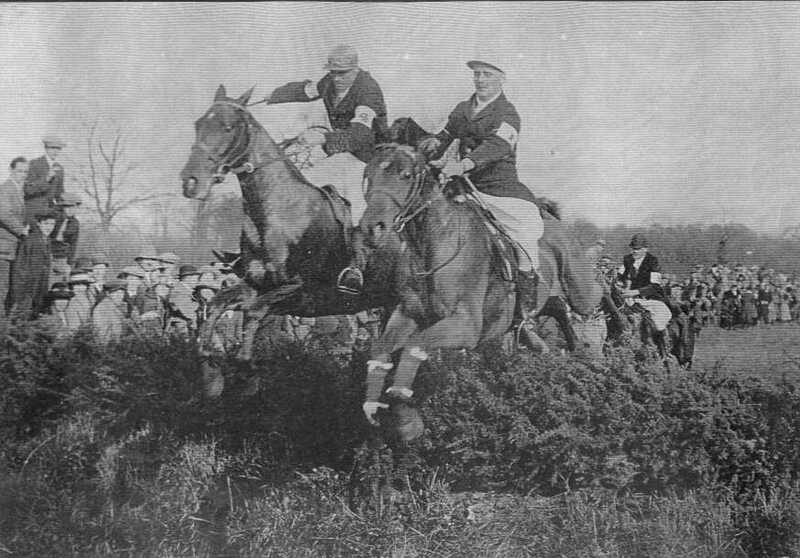 The 1922 Army Point-to-Point races at the Remount Depot included races for the Garth Hunt Cup and the Earl Haig Cup. The races were often attended by royalty such as H.R.H. 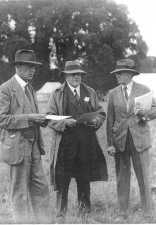 The Prince of Wales [later Edward VIII], The Duke of York [later George VI] and Prince Henry [later Duke of Gloucester]. 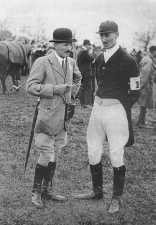 On 15th March 1924, both the Prince of Wales and Prince Henry competed in two races. In the last race, the Prince of Wales fell from his mount Little Favourite whilst attempting to jump a ditch. He was carried to the Moat House, and then driven to Aldershot, where he remained for a few days, before being driven to St. James’ Palace where, due to concussion, he was kept in a darkened room for three weeks. The Remount Point to Point course at Arborfield, where both Army and Garth Hunt meetings took place, are now Army barracks and housing. From the start, the course ran along the southern side of Kidgem Copse, the main covert on the Barkham Square estate, crossing Biggs Lane and later crossing the then A327 Arborfield to Eversley road. For some years now, all Point to Points have been held at Tweseldown Racecourse, near Aldershot. 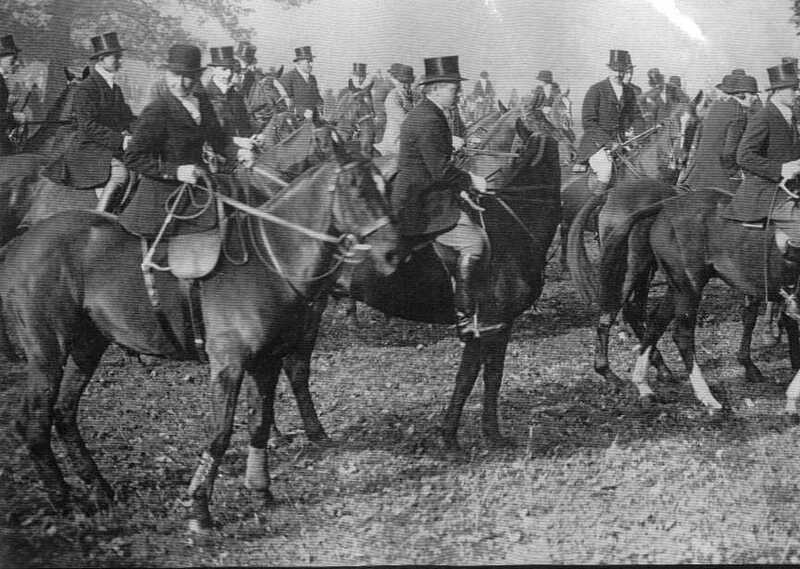 The Reading Mercury reported in detail on the Hunt season from September to the Spring, followed by Point-to-Point races. By the 1920s, virtually every week there were photographs of Hunt meetings, some of which were in and around Arborfield. In addition, a correspondent would contribute a column on the Garth Hunt, and others would write on the South Berks and related Hunts, including Drag-Hunts. Judging by the number of column inches devoted to the subject, Hunting was almost as much a spectator sport as was Football. Each chase was described in graphic detail, usually listing the most eminent taking part, and often describing the poor fox as 'Mr. Reynard' or 'Mr. Charles'. 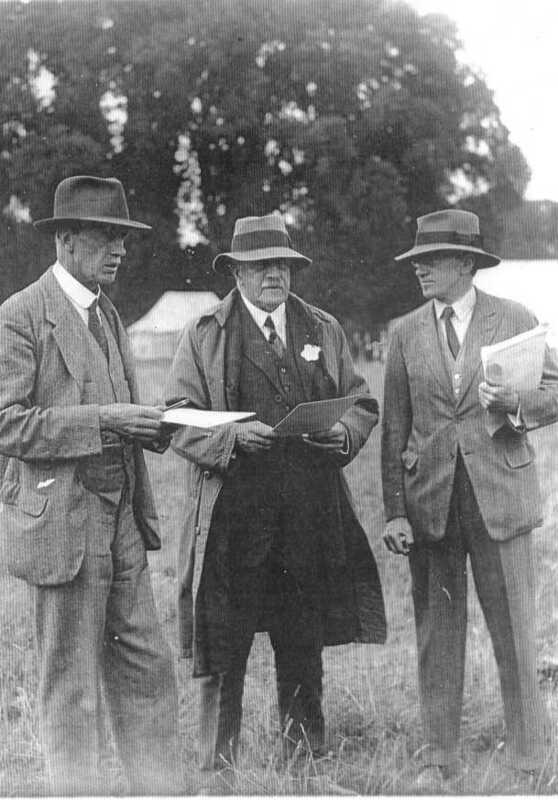 In 1926, Arborfield was mentioned about every three weeks, either as a place of meeting or as part of a wider circuit. Strangely, the 'Bramshill Hunt' Public House was rarely mentioned except in passing. The 'Bull' and the 'Mole' were listed far more frequently. The descriptions of each chase reveal how much has changed since that time, even without considering the change in attitudes to blood sports. For example, nowadays it would be impossible for a pack of hounds and a large group of riders to cross Sindlesham Road without injury or death, since traffic speeds are much higher than they were in the days when country roads were mainly gravel. knacker cart now kept, distance no object; good price given. J. Molyneaux, Garth Kennels, Bracknell, Berks. HUNTING NOTES: MR. GARTH’S: Bearwood Lodge on the 8th, when a large field was out and they had a nailing days sport. Hounds found in Bottle Copse, running straight for the Brick-yard, bearing away to the left, over the Barkham-road, by the Lodges, swinging again a bit left, away to Sindlesham, but being headed he popped back over the S.E.R. [South Eastern Railway] into King-street gorse, where hounds had a narrow squeak from a train, but the engine driver pulled up on time to avoid damage – for which many thanks to him. Our fox tried the earths in the gorse, but a man happened to be standing close to them and Master Charles, finding his entrance barred, ran across over a nice line of country, and there was much grief by the way to Bill Hill. Through the Park he swung at a great pace over the road to Ashridge Wood, but being again headed he bent round to Matthew’s Green, where he was viewed not 200 yards in front of the pack. He saved his brush by going to ground in a sewer drain, from which they could not evict him, though he was seen to leave later in the day. This was a ripping good hour’s gallop. Longish trot away to Finchampstead Ridges, hounds finding at once, running over the S.E.R., leaving Wellington College on the right to Ravenswood. Here the fox turned left back over the Railway to top of the Ridges, where hounds caught him after a bustling 30 minutes, when many of the field went home; not so the keen ones, who saw hounds find again in Longmore Bog, screaming away through Luckley to the Birches into Pondwood, where he was viewed dead beat just in front of the hounds by Harry, but Brackley had hounds stopped as the Hunt horses were done to a turn. So ended a rare good day. There was a photograph of the 'Meet of the Farley Hill Beagles at Arborfield Cross', showing the 'Bull' in the right background and the Parish Cottages to the left. See February 13th 1926 article here. 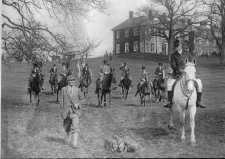 For a photo of an later 'meet' at the 'Bramshill Hunt' in 1931, click here. The Garth dog pack met on Wednesday, at the Greyhound, Finchampstead. ... One fox crossed the road and ascended the steep hill. Leaving the church on the right, hounds ran their quarry over the Nine-mile-Ride, through Longmoor, over to Kidgham and by Barkham, over the road to the Coombes into Bear Wood, where they were run out of scent. Hounds cast about in the Coombes, hoping to pick up their hunted fox, but failing this, they came back to Barkham and drew Kidgham through. 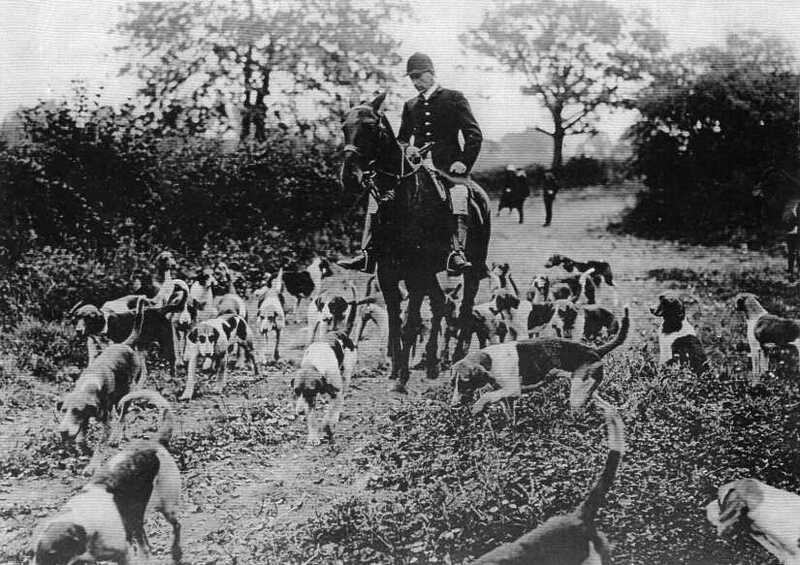 The next draw was the covers near the Arborfield Remount, and a fox was soon found, which led hounds away with a merry cry round Whitehall and Westlands. Leaving Arborfield Cross on the right, he crossed the road pointing for Moor Copse, then bearing left-handed went on to the Swallowfield Park covers, then re-crossed the road, running with some delightful music through the Farley Hill covers. Keeping to the left, he ran on by the Bound Oak towards Farley Castle, then turned back by Westlands and Whitehall, to be killed in the open on the hill between the Bound Oak, Farley Hill, and Arborfield, after a really good hunt. 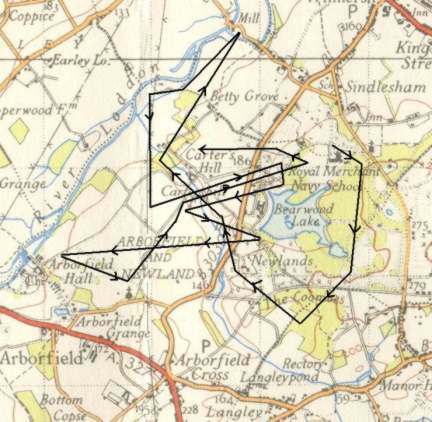 [There was a chase from Swallowfield along via Arborfield Cross and the Coombes to Barkham village, then on to Bearwood]. The Garth dog pack met on Wednesday at Bear Wood Mansion. 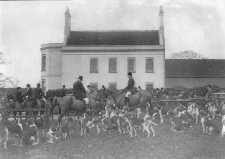 This is known now as the Royal Merchant Seamen's Orphanage, and is under the care of Captain Wilson, R. N., who kindly invited the hounds to meet at the Mansion, instead of the Bear Wood Lodge as advertised. All were most grateful to Captain Wilson for his generous hospitality. It did me good to see the orphan children looking down on the sporting scene. A fox was found immediately, but scent was very catchy and hounds could not make much of him. They drew the cover through Bear Wood Park, then went to the Coombes, where a fox was found, but the scent was indifferent. Eventually the fox was viewed away, and with a much improved scent outside, hounds ran him round by Newlands, leaving the Mole on the right, on to Carter's Hill, and after a really nice hunt, hounds marked their fox to ground near a hedge adjoining Mr. Dymond's Farm at Carter's Hill. 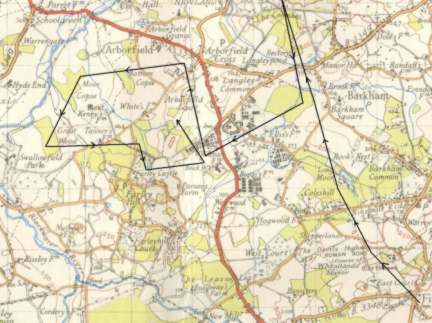 They were then taken on by Harman's Corner, and drew the covers just beyond Sindlesham, those towards Sindlesham Mill, and in the osier beds, between the mill and Carter's Hill. A fox was viewed away over the fields towards Bear Wood Park. They were quickly on the line, and this fox, turning right-handed, came back into Carter's Hill and broke away in the open towards the Mole. He was making for the earth, where digging was being continued for the other fox that had been previously run to ground, but finding people there, he turned back into Carter's Hill covers again. 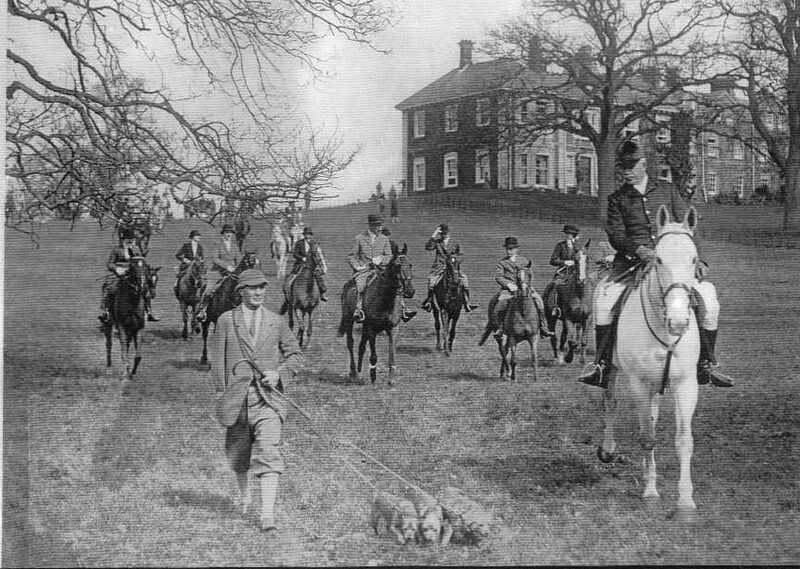 Hounds were pretty fairly close to him at times in the cover near Mr. Dymond's Farm, but eventually he made his escape in the open over to Bear Wood Park and he ran hounds out of scent. Hounds then made a cast back, and on to Mr. Hargreave's gorse, belonging to Arborfield Hall, where another fox was found. At first, he looked like going towards the church, but turned back and ran into Carter's Hill covers, and after dodging hounds for a time, he broke away across the field into Bear Wood Park and through the Bear Wood covers until he ran out of scent. Hounds then came back through Bear Wood Park and went on to Carter's Hill where they were more successful in killing the fox that had previously run to ground. This ended the day's sport. For an article on the Point-to-Point at Arborfield, March 1926, click here. For an article on the New Year Hunt, 1930, click here. For an article on the Garth Hunt meetings in Wokingham town centre, click here.